CenTex Smokers (Austin and Surounding Areas) | Smoking Meat Forums - The Best Barbecue Discussion Forum On Earth! Discussion in 'Texas Members' started by Misplaced Nebraskan, Apr 7, 2019. Welcome Y'all! I wanted to get a communal thread going for members in the CenTex Area. A place where we can discuss local things, random things, meet ups, and just general BS'ing. Please tag any and all members in the area! What defines CenTex? Best I've found to describe it is "Brady to Brenham, and Seguin to Waco" or the area of the Edwards Plateau. The Edwards Plateau is a region of west-central Texas which is bounded by the Balcones Fault to the south and east, the Llano Uplift and the Llano Estacado to the north, and the Pecos River and Chihuahuan Desert to the west. All courtesy of Wikipedia. Vaughn says: “Central Texas-style is popular because of its popularity across the country. For people who live outside of the state, their only connection to Texas is the one style of barbecue served in their own town—and more likely than not it will be central Texas. You see it in Seattle, Phoenix, and all over. In terms of rituals, you’re going to order meat by the pound at a counter. You’re going to see the person cut it, and the meat will be served on butcher paper. Seasoning is minimal, and sauce will be on the side (a lot of people mistake that for no sauce). 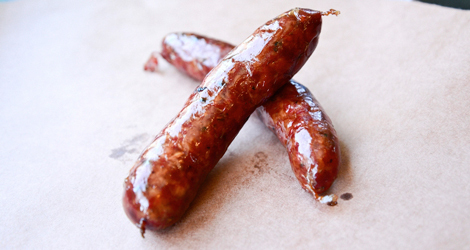 This barbecue style developed in the Czech and German meat markets following the Civil War. Meat markets didn’t have refrigeration back in those days. They displayed meats on shelves inside a case. After a few days the meat got ripe, so whatever meat you didn’t get rid of, you could either put it in the barbecue, or put it in a case and smoke it. That became the way to serve leftovers in meat markets. Meat markets were grocery stores. If you wanted a side item, you went to the aisle to see what was on the shelf. That’s the reason that pickles and white bread are so prevalent, because no one is going to be giving away avocado and tomatoes. What’s the cheapest thing you can offer? Raw onion, dill pickle chips, and white bread. Anyway, hope y'all find this useful and I'll keep this and subsequent lists up to date as best I can. If I miss something, feel free to PM me. Interesting that you bring this up. I was thinking exactly the same thing when I saw your response that you were actually in Pflugerville. I know I've seen some others from this region but am drawing a blank on who they are at the moment. I'll keep an eye out though and update as I see somebody. Now....I'm a huge fan of playing nice in the sandbox. The wife and I have a really nice sandbox to play in that includes a sizable chunk of land, a house with a lot of space, a thousand square foot covered patio, a pool, a bunch of cooking toys, and a keg-o-rator with two kegs of home brew on tap at all times. If we can garner enough attention to warrant it, we will happily host the first (annual??) Cen-Tex gathering. I designed and built the house with one specific purpose in mind: entertaining. This is right up our alley and we'd be honored to open our doors to our SMF brethren (and sisteren??). Let's see how this plays out and maybe something really fun can come from it. woodwindricky and Misplaced Nebraskan like this. Will have a full cover over it when done too. I think it'd be great to get some locals together for an annual shindig. I've met some great people through local meets. In looking, it seems a few have attempted to get local threads going for other areas but nothing in recent times. Hoping to start tagging others as I see them so we can have a place to chat and plan local events and general BS. Appreciate the offering of your place. Sounds awesome. Hopefully we'll get some traction soon and have a meet and greet at some point. Good morning! any lurkers out there? I don't think Tarrant county got the red shade on your map, but I voted in the poll anyways. Awesome thread idea and a really nice list of places to try. Thanks for creating it, Zach! A Blue Blood Virginian would like a few of those tacos! Have you seen a dog?I'm just looking for my dog,he's a Husky/Lab...Heh,works every time. Lost dog ya say?! I'll keep my eyes open! Tacos were awesome. Ate them a few days in a row. Definitely worth making. I'll have to post up the sauces we made at some point. Guess I should include up there all OTBS are welcome (really anyone is) . Just trying to get some local yocals together. bvbull200 and motocrash like this. Finally joined the club! Free koozies and rub to boot! Wings will be on the menu soon! G'Morning Lurkers and Passer by's! Hey there everybody. Sorry I've been absent from the party all week. This has been the most insane couple of weeks in my career. It's just been nuts and I have not even had time to log onto SMF, let alone post anything. Gonna do a little catching up here. Bull: If you wanna transcend county lines and come play, either in the forum or in person, you (and anybody else) are welcome. I have a great friend that lives in Conroe that I'm gonna invite to join us so certainly you're welcome. If I'm not mistaken, a few years ago we did a huge thread on bourbon which stated from me mentioning that I use it in a finishing sauce for brisket. I also think we shared a bunch or cooking pics over a holiday weekend (Memorial or Labor Day??). It was a while ago so I may well be wrong. Moto: We were pretty much neighbors for most of my life. You'r in Winchester, I was born in Alexandria and grew up in Manassas. My brother and his wife live in Strasburg which isn't far from Winchester and my mom lives in Fredericksburg. Zach: Those are some awesome looking tacos!! The wife and I are huge taco fans and these have been put on my must-do list. Since you're sharing, I will too Since day 1 I've always done ribs 3-2-1. Smoked, wrapped, then finished without the wrap and I never glazed them. The wife and all my friends have said for years that I make the best ribs they have ever eaten, which I'm quite proud of. I recently read a post here by a guy that does a lot of big parties and catering, which includes making a ton of ribs. Wrapping is a nightmare for him due to the volume he's turning out. He mentioned that he's cooking his ribs for 4 1/2 hours at 275, glazing them, and they come out perfect. Well, I decided to give it a shot on the BGE. Rubbed the ribs and put them on, made up a glaze, which came out amazing, and let them go. Ran the Egg with oak lump charcoal and a couple big chunks of hickory wood. Here they are after 4 hours. Looking good!! These turned out to be THE BEST ribs I've ever had and the wife thought so too. They were perfectly tender, pulled off the bone easily, and were as juicy as any that I'd ever wrapped. The biggest difference was the bark. You really don''t get much (if any) bark wrapping them but boy, this was amazing!! They also seem to have a lot more flavor by cooking unwrapped for a longer period of time. Needless to say, this is now my go-to way of cooking ribs and I'll never wrap them again. A few days later my buddy from Conroe (@woodwindricky) came for a weekend of sausage making and I did these again for him and his wife. Ricky isn't much of a rib guy but would make the 250 mile drive on a weekend to eat them if I was cooking....and that was my old way of making them. He and his wife both agreed also that these were far better than wrapping. Ya gotta give this a try!! If anybody wants the recipe I put together for the glaze, just ask. Wife says DO NOT change a thing about the glaze....it's perfect. Gotta run folks. I'll try to stay up to speed a bit better going forward but next week is starting out with the continued insanity so I'm not making any promises. woodwindricky, Misplaced Nebraskan and motocrash like this. More so than you thought,I grew up in Chantilly.Was chased outta there by growth to Bull Run Mountain,chased again to Winchester.The classic "go west young man". Yep....I remember when Chantilly....and Manassas for that matter, were just sleepy little bedroom communities. Used to love going hiking all through the Bull Run Mountain area, and did a bit pf partying up there in my late teens As a younger kid, we used to go to the big hill behind the building that was the hospital during the battle(s) of Bull Run when it snowed to go sled riding. That was right up to the point where I went down the hill at break-neck speed in a saucer sled, which you cannot steer, and smashed into the tree at the bottom of the hill. Man that sucked. Kinda took the wind out of my sails where sled riding was concerned. @motocrash , you peel membrane after cook? Any reason? Always find my self chewing on it if I don't. Always up to hear people's methods and preferences. I believe leaving the membrane keeps the moisture in them longer,which results in a better bite/texture. Yes,I remove it after cutting into 3-4 bone sections. This is to facilitate a better to fit on plate as to leave more room for sides. Makes sense. Haven't done a comparison, but might be worth doing. Thanks! Well since I'm on Lake Texoma I don't geographically fall into your group. But I do live in Texas and I travel all over the state. City Meat Market is one of my personal favorite BBQ joints to hit when I'm passing through Giddings. Since I'm not in the club I didn't bother voting but I actually enjoy cooking brisket. 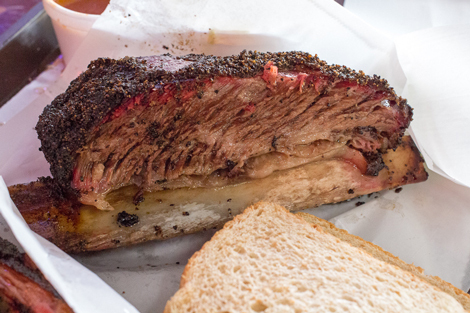 Hard to beat a properly cooked Texas style brisket.